The Dragalia may be Lost but you can find a hit RPG in the making, over in the App and Google Play stores! When the reveal of Dragalia Lost first come about earlier this year, it was at the time, a bit random. Not only was we revelling in the reveal of a new Nintendo collaboration as far as their mobile games go, but it would be a mobile game concerning a new IP and release it this year. Fast forward to the present. Although Dragalia Lost did not see a release in the likes of Australia, New Zealand, Canada or even Europe, the Cygames developed title did get to have the United States added as a day one launch title and it’s a good thing it did because Dragalia Lost is actually a pretty impressive RPG. It’s nowhere near as impressive as the likes of Xenoblade Chronicles 2: Torna – The Golden Country, which is just godly, but Dragalia Lost, even with the gacha system at play, is an impressive game that feels too good for mobile devices. I know the same can be said for a few RPG mobile games, but having played it as much as I have, it does actually feel like a game that would have been better off on the Nintendo 3DS or even the Nintendo Switch. It would naturally need bigger levels and more content to feel right at home on either platform as a “true game,” but Dragalia Lost is a gem that does have a great way of demonstrating what a gacha RPG should be like. Still, that’s enough praise for the meantime, after all, we’ve to get into all the nitty gritty details, so let’s correct that shall we? First and foremost, Dragalia Lost is not just another Japanese action role-playing game, it’s a JRPG that comes to us from Cygames, a developer who is no stranger to making mobile games and monetizing them in such a way that everyone can benefit. Only, it’s not just Cygames who are involved as Nintendo are also getting their hands dirty with it and the love child the two companies have created is a delight that you can choose to play on your own, or on the go. But as far as co-op goes, we’ll cover that later, first up is the story. 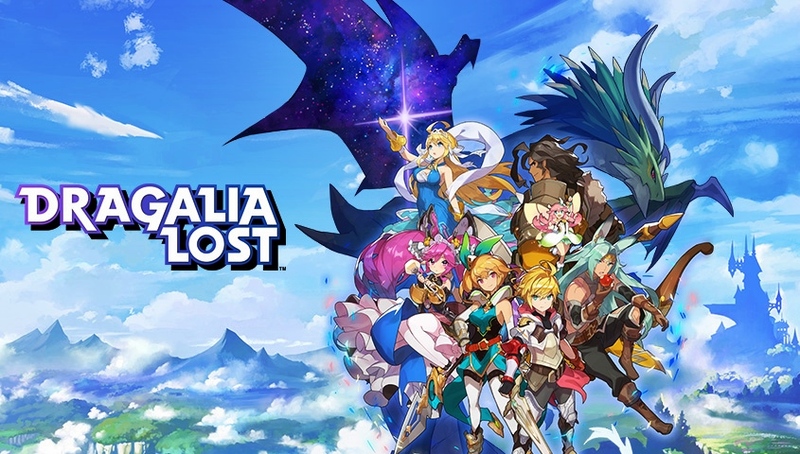 In typical fantasy-setting JRPG fashion, Dragalia Lost is an anime-like game, which in its current state, takes place in or around the Kingdom of Alberia. As for its story and main protagonist, both revolve around a young prince by the name of Euden, seventh in the line to the throne of Alberia. He’s also the twin brother to Zethia. Both he and his sister are born from a royal family that possesses an ability most do not and that ability forming pacts with dragons, which in turn allows them to transform into the dragons they’ve formed a pact with, temporarily. Only, unlike their older siblings and father, at the beginning of the game, neither Euden or Zethia have formed a pact with a dragon, since Euden has deliberately avoided doing so and Zethia actually walks a different path altogether from her family. Now, I could go into detail as to why that is, but Dragalia Lost is a new game that is currently denied to most of the world, so I’m actually avoiding spoilers as if they were the bubonic plague. However, what I can elaborate on, is the fact that in typical RPG fashion, what was meant to be a simple task, ends up being anything but and poor Euden ends up finding his whole life getting turned upside down. In the first 6 chapters of the game, he’ll come face to an ancient evil that the world (Grastaea) has been threatened by before, make new friends who will join him in arms and embrace a path he wished never to walk and enter into pacts with more than just one Dragon. As for the title and its relevance to the game, Dragalia is the word used to describe the trust between humans and the dragons they’ve formed a pact with. A Dragalia that was then lost and Euden is determined to see restored, along with peace for all. This ending is then followed by a notification that tells the player that the story will continue when the game’s next update rolls outs. (Yay!) It is something of a shame that players can reach the end within 10 hours of playing, but there is more to Dragalia Lost than just a main campaign made up of 6 chapters, which in turn are made up of areas that have their own playable levels and story segments, there are side quests in the form of missions in the Events tab. For the most part, they play out a lot like the main campaign quests, except these are quests you can just play over and over, in a bid to grind gold, upgrade materials and elemental upgrade materials. As for how to play, the quests are pretty straight-forward. Players must navigate a given area, using their finger on the screen and sliding it in the direction they wish to move. Upon seeing an enemy they wish to hit, they must tap repeatedly and when available, press the highlighted skill icon or even the highlighted dragon icon, to perform a special attack or turn into a dragon and deal devastating damage. Most levels consist of two areas, the first which you must explore and contains things like environmental hazards, enemies, crates and that can drop a health-restoring item that acts immediately and chests that drop useful items and weapons. As for the second area, they’re where you can expect to engage a big bad boss in battle, who may or may not be alone. By completing a level, players can earn EXP for their characters and themselves, as well as keep the items they discovered. If they fail it, they can opt to use Diamantium (a type of currency players will need to buy with real-world money,) or Wyrmite (a type of currency that players can earn,) to continue. Personally, on the occasions I did die on a level, I never did bother with paying to continue, as I just took my failure to mean I should forget about trying to do a level on my own, and do it via co-op instead. How the two modes differ is fairly minimal and co-op is very beneficial. You see, when playing on your own, players will need to make a team of up to 4 Adventurers, equip them with the best weapons, dragons and Wyrmprints they have (a card like item that each have their own special effects.) You’ll also need to try and make sure their levels are similar, but not with co-op. With co-op mode, players only ever need to focus on having one high powered character and dragon, as they can then join up or create a room of their own and be paired with a team full of high-powered. Sometimes you can create a room and everyone is ready to go within seconds, but other times, it can be a couple of minutes before everyone is ready to set off. I’d say the waiting can be exhausting at times, or at least a little long-winded, but playing with others is the best way to play Dragalia Lost and get all of the good stuff. You can also communicate with one another by using stickers and for every new player you play with, you can get another 50 Wyrmite for free. Another co-op benefit, which is a rather big one, is the fact it offers a way to keep on playing when you run out of stamina. Being a mobile game, a stamina is expected, but with Getherwings, players can use these free items to join rooms created by other players and play with them, while you wait for your stamina to fill (6 minutes to recover one stamina point.) or level up. When levelling up, not only will your stamina recover, but your Getherwings will be restored as well. Essentially, co-op is a great means of playing Dragalia Lost for free, for hours on end. You will not have to worry about investing a cent into the game, but you might want to have your charger handy as Dragalia Lost is a battery killer. Sure, downloading everything will have the game take up a whopping 2.51 GB on your mobile device, but one additional download is better than having to download each and every level when you go to play them. Anyhow, even if you invest a hundred hours fighting, the battles are only half the war as Dragalia Lost has lots of other features and facilities for players to take advantage of and strengthen their units. You do however need to make sure you continue playing the main campaign long enough to unlock the likes of an auto play mode that will have an AI control your team of 4, unlock Castle, and a few other things, such as a hard mode. Ultimately, it depends on how the player chooses to play Dragalia Lost, in which they’ll gain access to everything, but once you have, with the Upgrade menu, you will be able to upgrade Adventurers, Wyrmprints, weapons and dragons, as well as craft new weapons that are stronger. For things like weapons, dragons and Wrymprints, in the event you don’t have any upgrade materials, you can always sacrifice weapons, dragons and Wrymprints you don’t need. You’ll also be able to take advantage of Mana Circle and spend both items and Mana to unlock nodes that will allow your characters to learn new abilities, improve their stats and buy Adventurer Stories. The latter is a story-like segment that gives players an insight into the characters they have been fortunate enough to acquire. You’ll find this feature over in Castle. In Castle, players can also visit the dragons they have bonded with and give them gifts. There are gifts you can earn by buying them with gold, which can be earned just by playing and then there are those you can earn for free. In return, the dragons will also give you some great gifts, and as your bond grows, you’ll be able to hear their Dragon Stories. Then there is also a build mode with Castle Grounds, where players can place facilities and level them up. Some facilities will earn you gold, whereas others will boost attributes and grow Dragonfruit, which is an item that can be used to level up your dragons. If after all that and you’re still looking to improve your team, you’ll have no choice but to combine multiple dragons and Wyrmprints, by “unbinding” them, as this will allow you to level them up further. Weapons can also by unbinded, but to strengthen your characters and add another star to their rating (5 is the max,) you will need to promote them, which requires Eldwater. Eldwater can be earned just by playing, but it is a slog and it will be a long time before you get to promote anyone to 5* status. One way which can speed the process up however, is by summoning. Whether you’re using your real-world money or all the Wyrmite that you can earn, via completing missions, quests and daily accomplishments. By summoning, you can summon new characters, dragons and Wyrmprints. As great as it is to get a new character, by getting someone you already have, you can get Eldwater instead and the higher star rating of the character, the more Eldwater you can get, thus speeding up how soon you can promote someone. Honestly, I have lost count of how many times I have done a ten-fold summon already, but I have yet to pay anything and I have two great 5* dragons, one 5* character named Hawk and a couple Wyrmprints as well. I’ve also managed to get plenty of lesser starred characters and fill out my rosters quite a bit. Not everyone has had a similar luck as myself, as some have had worse, but others have had better and their collections put mine to shame, but for a gacha game, so far I have not felt pressured to pay for anything, not even when in the game’s shop, where special bundles and items are available. For me, that is Dragalia Lost is at its finest. Some have nothing but praise for its chosen graphical choice and killer soundtrack that is foot-tappingly infectious, but for me, the fact Dragalia Lost is a mobile game with plenty to do and what feels like minimal pressure on buying into it, makes it a winner in my book. If you chose not to summon at all though, you can earn adventurers and dragons, just by playing through the main campaign. It also has more RPG-like gameplay going on and a similarity to Sushi Striker: The Way of Sushido, what with the character designs, game menus and texts, which only makes it all the more enjoyable. Naturally, Dragalia Lost is not without some issues as the home menu can soon get overcrowded and it is perhaps a little too “grindy” and can have the occasional performance issue, especially when playing co-op, but so far, it is certainly a game that should give Fire Emblem Heroes a run for its money, and at least perform half as well. After all, the two comic strips it have are cute, funny and like the rest of the free-to-play Dragalia Lost, don’t cost a single thing! Cygames were already a fantastic developer in their own right, but with their knowledge, Nintendo’s talents and both parties joint expertise, Dragalia Lost is not just another run-of-the-mill JRPG, but a great one. Just because you can pay to get ahead, or just to get all the good stuff, but you don’t have to if you don’t want to. You can grind for hours on end, the means are there so you can do so without paying. Sure it gets repetitive going through it all, but what is an RPG without some grinding, especially when it’s for one of the best RPGs to grace mobile devices this year?